I bought this brassy thing at an estate sale last weekend. I know that it's an old fire fender, but the dimensions are a bit off. I usually think of fire fenders as being longer and not so tall. I found this on the Christie's website here. Gorgeous but way too ornate for me. Love those finials. This was on 1st Dibs here. I plopped Bitsy down next to my fender to show the relationship between it and a small dog. She didn't know what it was, but she was pretty sure that she didn't like it. It's 11" tall and 18" wide. The following photo shows it in more of a 3D effect. You can see that Thomas is plotting his next move. "Hmmmm…. Should I check out that new bird nest or maim a lizard? Ambush Bitsy or dig up an earthworm and play with it in the house?" So my dilemma is what to do with my new find. I have another brass fire fender that I'm using on a bookshelf. I love this look, but it wouldn't work with my new fire fender because it's too tall. I've been reading lately that brass is coming back into style. I never knew that it had gone out. I have several brass accessories that I love and will always use, whether they're trendy or not. Here's my tiny little brass book holder. It kind of looks like a miniature fire fender. Notice that one of my majolica birds is sitting on a glass riser. My friend Julie bought it at Wisteria for my birthday. You can read my Wisteria story here. If any of y'all have suggestions of what to do with my new fender, I would greatly appreciate it. Thanks for stopping by the Terrace and have a great weekend! Sally - I think that's a great idea. Thanks! Your tiny little brass book holder, which actually is a miniature fire fender, is a vintage/antique salesman's sample or so I've been told. I have three of them and never thought to stand them on end as you have done. How unique! I think I'll copy this! I like your newly acquired piece and think it would also look good used to corral a set of books. Other than this, I'd have to put my thinking cap on. It is, however, a really nice piece. Karen - Thanks so much for this information. I always wondered what these little brass pieces were used for, and now I know. Makes sense. Thanks for stopping by. 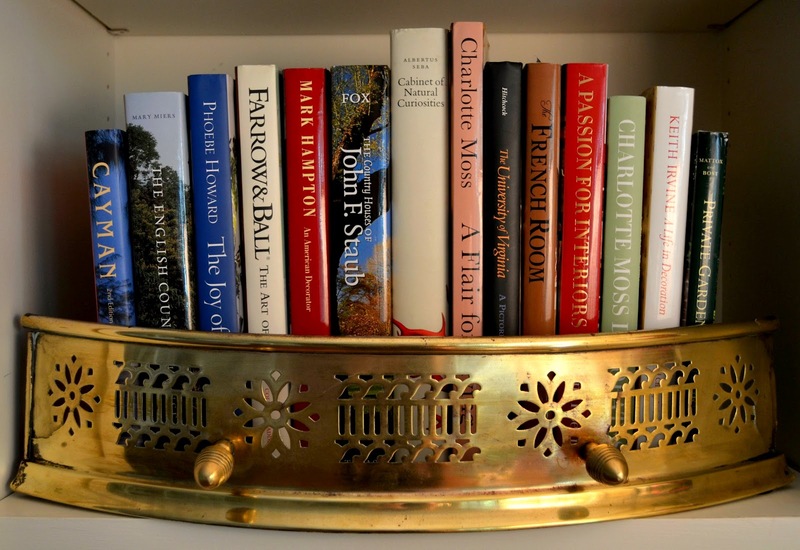 I love your little brass book holder. I want one!!!!!! I'm so happy that brass/gold is making a strong comeback. Could you prop it against a wall and use as a cane/walking stick holder?